Thanks a lot. I am having a lots of good time here. I don't have anything to say rioght now about the course but I will surely post if I don't get things correct oor will be unclear anywhere. Thanks a lot and really apreciate your effort. I just want to know about that can i download this book or if you are able to send it on my mail please do it very fast. I really need it. Thanks for your comment. We are working at the PDF version of the book so that you can have a read of SEO in Practice in your favourite format. BUT any chance we can make this easier to read? Does it "NEED" to be in a 5 inch wide window? I mean how does a spiral bound graphic and left and right widget boxes help me to read a long and detailed document, exactly? I'd even pay $$ for a PDF version I can read on my tablet. I just hate reading detailed stuff on a screen. So I'm never going to get to read this but thanks anyway! Got a 5 line summary I can take away and actually use? Thanks for leaving your kind comments. I do believe you'll find the guide helpful. Read on and keep in touch! Thanks Dan, for introducing me ! looking forward getting my "certificate". You found a great plan to get people like me stuck on your page. Well done! I have built four main websites from scratch and 23 Squidoo lenses. In the beginning I spent hours and hours trying to learn, what I thought would make my websites be successful. Well here I am Six years later and still learning, so thank you very much for the invitation to learn, and I am looking forward to see what you have to teach. Ted, as far as I can see you have no HTML knowledge at all so you will either need a webmaster or link building software like LinkAssistant (I'm talking about it in Part 5). In LinkAssistant you find partners automatically and then generate a link directory (a special page for your website, with links to your link partners) and upload it to the web server staright from LinkAssistant (so that it can be seen on the Web). With LinkAssistant setting up links is easy and does not require HTML knowledge at all. Here is where you can learn more about <a href="http://www.link-assistant.com/linkassistant/">LinkAssistant link building software</a> and download the free version. 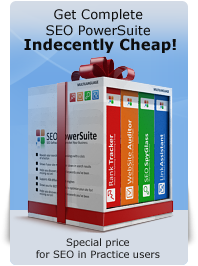 And here is where you can <a href="http://www.seoinpractice.com/seo-software-bundle.html">get LinkAssistant in a bundle with other useful SEO tools</a> saving a pretty sum. I was reading your link section and noticed that I did not know or see how to do the links. That is once you get them how do you install the link in your website (is there an easy way?). If there is specifically how do you do it? Can you put a 2 link in a 5 link place (not that you would want to but what if you did?). I was impressed about how to find a link and how to find the right links.